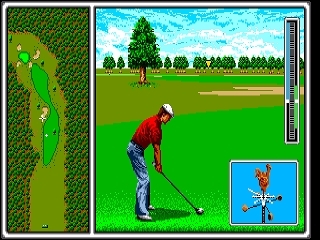 Arnold Palmer Tournament Golf was the first golf game released for the Genesis. Although the game bears his name and his picture graces the box art, aside from the title screen Arnold Palmer does not appear in the game. In the game’s “Tournament Mode”, you play 12 rounds of golf across three courses; United States, Great Britain, and Japan. By earning money completing rounds of golf, you can upgrade your clubs to increase your distance. In “Practice Mode”, you can play a round of golf on any course or select individual holes to practice on, and you can use any of the sets of clubs. Like some of the old 8-bit golf games, APTG does not display the ranges of your clubs on the screen, so you either have to memorize the distances of your clubs, or look it up in the manual. While this is an inconvenience in comparison to newer golf titles, I think it adds a bit of realism to the game, and there is an added satisfaction after a great shot in knowing that you selected the correct club. I do wish however that the game would tell you how far your shot went after you hit it, which would help you to learn the distance ranges of your clubs. Before each shot, your caddy will tell you how many yards you have left to the pin. Later, as you progress through the tournament, your caddy’s skill will increase so that they can tell you the distance to various landmarks, which aids in club selection. The game’s controls are very forgiving, as it is impossible to hook or slice a ball unless you adjust your player’s stance. Putting is also fairly easy, and uses the same matrix of arrows popular in 8-bit golf games. While Arnold Palmer Tournament Golf is primitive in comparison to later golf titles, you can definitely see the progression from the 8-bit generation. It isn’t the best golf game on the Genesis, but its arcade-like feel makes it a lot of fun, and hidden gems like the Fantasy Zone mini-game and Alex Kidd putting during “Coffee Breaks” add to the enjoyment and ambiance. Buy Arnold Palmer Tournament Golf on GameGavel or Amazon. Tagged Arnold Palmer Tournament Golf, genesis, Golf, Review, sega, Sports. Bookmark the permalink.